How do I configure the RPM on my DASH2 PRO? Start up the DASH2 PRO configuration software. Click on the �Wheel speed and RPM� icon. 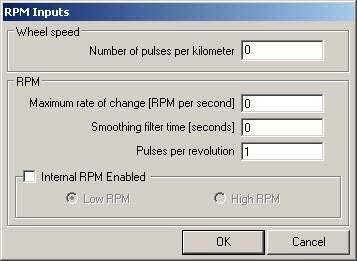 Set up the number of pulses per engine revolution from the engine speed sensor. The smoothing time for the RPM can also be set here. For a good quality signal it is recommended that the maximum rate of change and the smoothing time are both kept at zero. If the input signal is of very poor quality these settings can be used to filter out any noise on the input. By default the RPM signal is set up to come from the High RPM input. This input connects directly to the low tension side of the ignition coil. If the Low level input is used it can be selected here. If the RPM signal is to come from an ECU interface, CAN input or from another serial source then the internal RPM sensor can be disabled here.